The Bird Info page has in-depth discussions of bird identification and updates to the bird guides, listed by species. The Sibley Guide to Birds represents more than 12 years of work by David Allen Sibley. The final draft of the artwork and text took over six years to complete, and the finished book was published in October 2000. Before painting and writing the final draft David spent over 6 years working on the problems of layout and design. The challenge was to meet the goal of illustrating every species and every significant plumage variation; illustrating every species in flight from above and below; describing the complete range of vocalizations for each species; showing all significant subspecies variations; and doing it all in a format that is logical and easy to understand so that even beginners would not be overwhelmed by the amount of information. The solution was a new and unique design arranging each species in a vertical column on the page. Most two-page spreads show four species, with the images of birds in flight lined up across the top of the pages, birds at rest below that are arranged from the drabbest plumage at the top to the brightest at the bottom. Beneath that is the voice description and then the range map. The book can be thought of as a continuous strip to be scanned horizontally, with birds in flight across the top and range maps across the bottom. Arranging the birds in this orderly way allows the user to make comparisons easily between different plumages of the same species (by scanning up and down) as well as between similar plumages of different species (by scanning left to right). If you’ve seen a drab fall warbler, all you need to do is scan the upper images of each species to see all of the drabbest warblers. If you’ve seen a woodpecker in flight, a quick horizontal scan across several pages will show all the possibilities at a glance. A quick index for the first printing of the large Sibley Guide is still available at the Avisys website here http://www.avisys.net/field%20guide%20indexes.htm. The 4th printing and later of the large North American Guide, and all printings of the Eastern and Western Guides include a quick index just inside the rear endpapers, so there is no need to print your own. We’re working on it. I’ve been tweaking the Blackberry version and expect to be looking at a beta version for Android any day now, and hopefully it won’t take too much longer to get those out for public release. I am having trouble finding the Android version is it out by now? Each species has a small map showing the range in summer, winter, and migration. But there’s no indication of the dates beyond that. In most states or counties you can get a checklist with “bar graphs” showing each species’ status monthly or weekly through the year, and ebird also can show some graphs. That will give you much better local information than the broad overview that the books show. Hope this helps. Do you publish the Field Guide to Western Birds in Spanish? Your guides are now the standard. Thanks for your hard work! My guess is you are seeing Virginia Rails. The only birds with black chicks are in the rail family – rails, moorhen, coot – and among those the Virginia Rail best fits your description. Nice find! My four year “used” soft cover Eighth Printing edition of The Sibley Guide to Birds has been referenced an average of several times a week and is immensely appreciated for its content and the quality construction of the book itself. Hola sr. Sibley. Quiero decirle que su guía es excelente!! de mucha utilidad aquí en México para la identificación de las aves migratorias. Saludos! So I don’t have buyers regret, are you working on a revised edition to be released anytime soon? I am currently working on a major revision, but it won’t be out until Spring of 2013 at the earliest. This is a sweet story. I had wanted your book since it first appeared, but having just depleted my guide book funds with butterfly, dragonfly, Howell & Webb, New Nat Geo, I just didn’t have the funds when you were here at the RGVBF to get it. So I waited. I went to my local thrift store one day a month ago and they were just restocking the books and guess what I found? A virtually new book, yours, lying on top, only the cover was creased, the insides not even written in or a name in it. This may not sound so sweet but wait. So I open it up when I get home and there is a clipped out Reader’s Digest article about your book in the back. Clipped and stapled. Aw. Maybe some little grandma found the book too big to carry around or the writing was too small? Who knows? Her loss, my gain. I had heard you made some interesting comments of an anthropomorphic nature and finally came to one that I love. It’s true, the White-winged dove does have a “bemused expression”. Made me wonder what Gary Waggerman, my friend and WWD expert thought about that one. Did he ever talk to you? He’s gone now, but this made me smile. I am especially enjoying the hawk section, since we get everything down here in the RGV. Am studying it now and enjoying the whole book. Thank you for your great achievement. I just purchased your eguide for my Android device. Once loaded I could not open the app. It displayed the cover but I could access any of the content. I noticed that another disappointed purchaser had the same problem and commented on it in early Feb. Please advise. I’d like to be able to use your app. Hi Alan, Sorry to hear that. I’ve forwarded your question to the developers and hopefully they can sort it out for you quickly. I should say that all comments like this are forwarded almost immediately to the developers, and so far I think all have been resolved satisfactorily. I don’t always post a follow-up here, but I will try to do more of that since the solutions could be helpful, or just seeing that there was a quick solution. The entry in both the field guide and app for Whimbrels notes that they don’t mix with other species. This contradicts other field guides, but also I’ve seen them on the northern California coast in winter in large flocks with marbled godwits and willets. I have seen this several times, the most recent being today. Hi Kel, Thanks, yes, I should qualify that statement. What I was thinking of was that they seem to keep their distance and move independently when foraging, and generally don’t mix with other shorebirds in foraging flocks the way that, say, Dunlin and Western Sandpiper do. But that’s a subtle distinction. Hi Billy, No, just the big guide covering all of North America, and the smaller Eastern and Western guides. I’ve thought about other options but decided this is the best approach. Does the guide to birds of N America include Hawaii? I followed the American Birding Association region, which does not include Hawaii. I would like to add the Hawaiian species to some future edition of the guide, but first I need to get out there to see them. Thanks Brian. That’s already fixed. It was an embarrassing glitch in the first printing. Hi David, Thanks for responding to my photos, They are now yours and may do as you wish with them, thanks again for the educatoon.Best to you, Bill Pamplin. David, thanks so much for all this great knowledge. I appreciate the way everything is laid out and easy to find. I discovered your books yesterday with the help of Ron and Barbara from Dolphin Charters. Now I’ll know a little more about my environment. Hi Gary, Thanks, and I’m glad you enjoy the book. The key to map colors is found inside the front cover of the book. I just received the flashcards as a birthday present, and there is no key to the three map colors anywhere in my set – as a separate card, or on the box. I’m confused! OK – I just found my answer on the flashcard pages. Bummer. I don’t have a color printer, so I’ll just write it out and stick it to the back of the box. Are you any closer to publishing the latest revision? Getting closer every day, of course, but we may be pushing the date back six months to spring 2014. Hello. I’m curious as to what is the most current printing of The Sibley Guide to Birds. I am in the process of trying to purchase a copy and naturally I want the most current. Every online site I have visited only lists the original printing date of 2000 without mention to current edition. Any info you can give is greatly appreciated. Thanks. L.
All copies of the guide are the same edition, first published in 2000. There have been multiple printings, and a few minor corrections were made in the 4th printing, but every new copy you find for sale now should be later than that. Is the Field Guide available as an ebook? If so where from? I know that you offer the app. but I am unsure if I would be able to make annotations/highlight text etc. on the app. Hi Karen, Thanks for your interest. The field guide is not available as an eBook, only as an app. The app does not allow highlighting text or adding notes, although I know that would be a useful feature. You can enter sightings and add notes to those, so you could create a new “location” and call it something like “My Notes”, then browse your list under that location to see all of the species. That’s not a very elegant solution, but maybe it would work for you? Is the Sibley Guide to Birds the one to use in Texas? Hi Tom, You can use the big Sibley Guide to Birds anywhere north of Mexico. If you’re choosing between the smaller Eastern and Western Field Guides, then the Eastern Guide works in most of Texas, but if you’re birding “west of the Pecos” in Big Bend, then the Western Guide is the better choice. Discussions are ongoing, and we are hoping to have an app update to go along with the revised edition of the printed book. 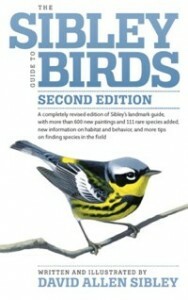 I heard a rumor about a new edition of the Sibley Guide to Birds becoming available in the next few months. Is this true? I can’t find any information online about it. I love your birding guides and am looking forward to the 2nd edition. Are there plans to publish a second edition for Birds of Eastern N.A. and Birds of Western N.A. as well? In a previous posting, I reported that a Quick Index in the second edition was missing. While breaking my newly acquired book in, I found it on the last page adhering to the previous page–my mistake–a Quick Index is in the book. Again, congratulations on the second edition. The field markings are great and I really like the well written, short introduction to each specie. I love your field guides. I don’t go anywhere without them! I purchased two copies of the second edition of the Sibley Guide to Birds first printing and have recently learned that there is a second corrected edition (color and print). Would the publisher exchange my two first printings or do I have two valuable collectors items? Thank you for sharing your wonderful talent with us birders. Do you ever get to St. Louis? Thanks For Sharing this blog…..becoz I love birds and the topic is very nice also thanks to you now I can do rangoli at my home which also wants to draw at my home outside the place. Hi Mr. Sibley, Im from baja mex. I made a checklist from my place, look for Ranulfo Mayoral and you will find Birds of My Home, I need your opinion, thanks. Hello Mr. Sibley! My girlfriend’s birthday is coming up soon and I would really like to obtain a copy of one of your books signed by you for her! She has just recently gotten into birding under the “wing” of our Zoology professor. Is there any way I can obtain one? Thanks for your interest. You can order books directly through this website (click the “shop” link). All of these books are signed, and if you’d like to add a personalization there is a space on the order form to add a note.